Dwayne McDuffie, the founder of Milestone Media, died Feb. 21, 2011 at age 49, after experiencing complications during emergency heart surgery. —Los Angeles Times, Feb 24, 2011. 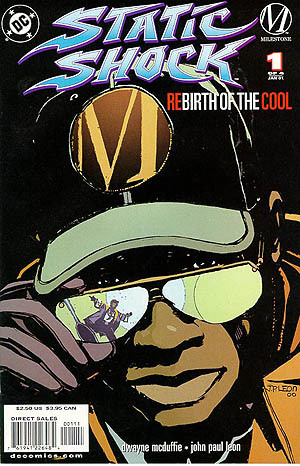 One of the most popular characters created by McDuffie and the Milestone group is Static, in the comic Static Shock, which inspired the animated cartoon of the same name. McDuffie has also authored many screenplays, edited scripts and produced animated features for programs such as “What’s New, Scooby-Doo?,” “Teen Titans,” “Static Shock,” “Justice League,” “Ben 10: Alien Force.” McDuffie wrote the screenplay for the recently-released All-Star Superman.